Hi everyone. Welcome to the second day of my "Twelve Tags of Christmas" Event. 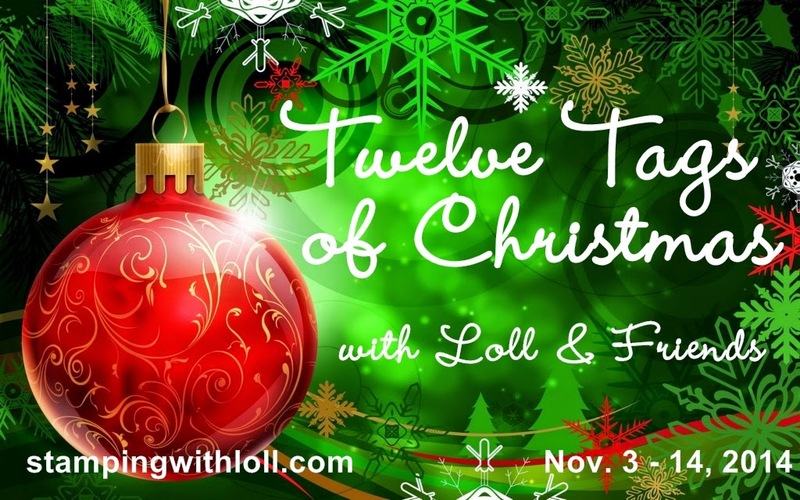 For twelve days (Nov. 3 - 14) I will be posting a mixed media Christmas tag along with a tag made by a special Guest Designer. We hope our tags inspire you! Come join in the fun and link up your Mixed Media* Christmas tags below. This tag (2 1/8" x 3 5/8") was inspired by another one I saw on Pinterest. It is sponged with Peacock Feather's Distress Inks with a little Evergreen Bough ink added to the edges. Large and small snowflakes are randomly stamped all over the tag in pigment white ink. A piece of drywall tape was cut to size, and then painted with silver acrylic paint. The Christmas tree and three snowflakes are die-cut from white ... silver acrylic paint was sponged on the bottom edges of each layer of the tree die-cuts. The sentiment is stamped, cut out and popped up on the tag ... and lots of small drops of dazzling details glitter glue was added for sparkle. A white and silver ribbon finishes the tag. Today's special Guest Designer is Kylie (Kylie is Addicted to Stamps) ... she really is!! :) Most of you probably already know Kylie ... but in case you don't, let me fill you in. She is the owner to two challenge blogs --- Addicted to Stamps and More; and Addicted to CAS (I’m on both Design Teams – yay!). Ane she runs a new stamping forum called Happy Little Stampers where members share info on supplies, techniques, and anything else that comes to mind. Kylie is also on the design teams for Inspired by Stamping, and STAMPlorations. She is busy, busy, busy!! ... and she makes the most beautiful cards. She is a master of colouring, specializing in Spectrum Noir markers … and she is just starting the foray into mixed media and loving it! To learn how Kylie made the beautiful tag below, please click HERE. Gorgeous tag Kylie! Thank you!! See you tomorrow with another Mixed Media Christmas Tag and special Guest Designer! Loll, I love your tag - gorgeous sense of frostiness, gorgeous colours (no surprise there - you know me and blue! ), and lovely details like the drywall tape! And I love the rich red of Kylie's. Now I must check out the ones that others have already linked. Such fun! Snowy, frosty gorgeousness happening here, Loll! Love the colors and all the Christmas goodness wrapped up into one beautiful tag! An awesome tag from Kylie! I'm off to her site! OMG Loll, Your gorgeous frosty textured tree and amazing Mixed Media tag just jumped right out at me. You have inspired me again to play along! Super textured tag -- love that fun tree! Been busy recovering from another surgery Loll but still following and love the cards and the tags are such fun! Love this! Love both these tags! Loll, I love how the silver is woven into your tag in multiple ways and the overall color is so lovely. On Kylie's, I love the richness of her blend ink and the script in the background. Talk about coincidence...I just visited Kylie's lovely red tag before jumping over here (in my quest to catch up again!) Enjoyed learning a bit more about Kylie, and am intrigued about the resource forum, so will check that out. Thanks for the info. DH just got me some of the drywall tape - still in the wrapping. I love what you've done with that supply on this gorgeous icy blue card. So much detail, dimension and sheer lovely in this tag. I have a DT commitment to finish and then hope I can join in with the fun. I'm not a 'tag' person but you & Kylie have presented some fabulous inspiration. TFS & Big Hugs. 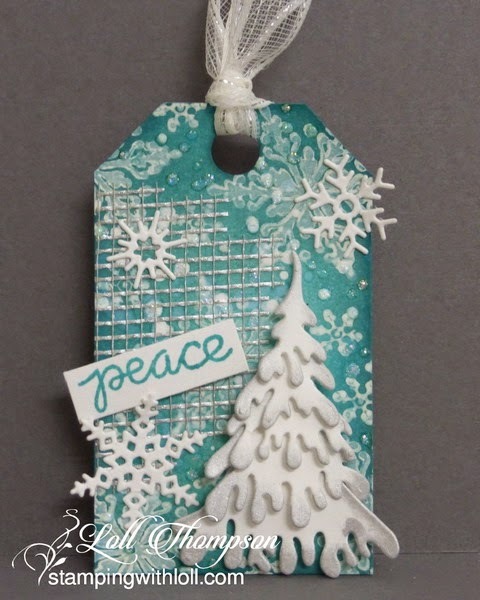 Love this tag with that pretty die cut Christmas tree! The silver drywall tape adds such an unexpected and elegant touch! So much to love about your tag, Loll! I love all the texture and dimension, and the combo of Peacock Feathers with the white snowflakes is stunning! I'm intrigued and can't wait to see more! The colors are stunning on both these tags! Two fabulous tags! I love all the layers and detail on your peacock, white and silver tag, Loll. And Kylie's tag is so elegantly vintage. Two totally different but each absolutely beautiful tags. What a fun event Loll! Such wonderful inspiration today! Love that layered tree die Loll (I have that and must get it out!!) - beautiful aqua color and lovely texture - and Kylie's tag is gorgeous in the red with the text background! OMGorgeous! Loll, you tag makes me want to run home and try my best at casing it immediately. Then, I want to do the same with Kylie's tag. Two stunning beauties...love them! Wow Loll. Jawdropping beauties from you and Kylie. Love how you added texture.